Based on the industry standard 19 inch width, the XRackPro2 will rack mount electronic equipment. The 19 inch standard allows for equipment and accessories to be rackmounted with confidence. The GizMac Accessories XRackPro2 rack is designed with the superior rackmount 4 post system. Using a 4 post system allows both 2 and 4 post mount equipment to be installed. The XRackPro2 rack cabinet uses an innovative independently adjustable 4 post system so depth of 5 to 32 inches can be set. 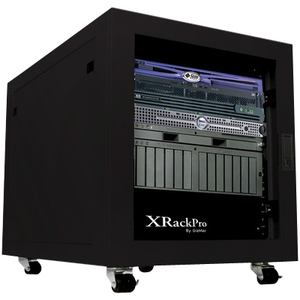 XRackPro2 is a rackmount enclosure cabinet that incorporates noise reduction, air filtration, security and mobility. Rackmount computer servers and RAID storage become whisper quiet in this rolling rack system. Solidly built and providing 12U of 19" (48.2 cm) rack mount space, the second generation XRackPro2 is an ideal server rack and computer cabinet for Apple (Xserve server and Xserve RAID), Windows, Linux and other PC computer rackmount servers.